We hope the information below is enough to get you started. If not, feel free to ask your question via Twitter or email us at "support" at the obvious domain name. Is ReadyTiny a replacement for Google Reader? Why don't I just run TT-RSS on my own server? Where do I sign up? Where do I read news? How can I customize my account? I want buttons to share to Twitter/Facebook/Google+/Kindle/Pinboard/Pintrest/etc. Can I use ReadTiny on my phone? Can I use ReadTiny as the default reader in my browser? Can I read feeds that require authentication? Can I minimize the article windows by default? Why is this page so boring? ReadTiny is a web-based reader for syndicated feeds using RSS and Atom—blogs, for example. You can also use ReadTiny to generate your own syndicated feeds that remix existing content or that include arbitrary content you've added. This means that you can even use ReadTiny to manage your feed subscriptions and filter content, then do your actual "reading" with the software or web site of your choice. Yes. If you've exported your Google Reader subscriptions, just upload the OPML file to your account here under Actions | Preferences | Feeds | OPML (hiding at the bottom) | Import my OPML. 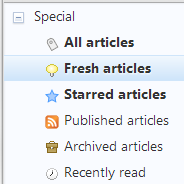 We've also installed a plugin that will allow you to import your starred and shared items. So why should you pay for something you can get elsewhere for free? Maybe you shouldn't. But we think Maciej Ceglowski (creator of Pinboard) made a pretty compelling case in his post "Don't Be a Free User." (He convinced us to pay for Pinboard, anyway.) At ReadTiny we're commited to running an ad-free, quality service—and to respecting your privacy. What's that worth to you? 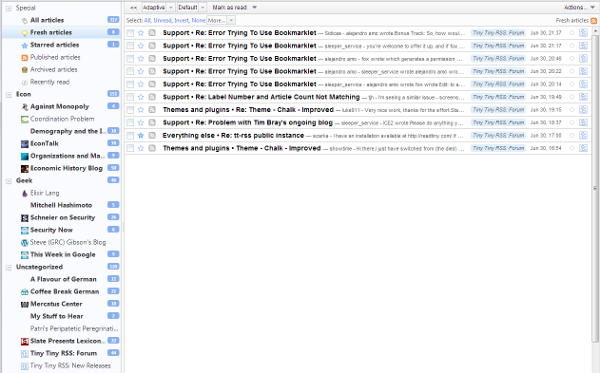 ReadTiny is powered by Tiny Tiny RSS (TT-RSS), a powerful, highly-customizable, open-source syndication platform. (We didn't write TT-RSS; we're just enthusiastic users.) Stop by the TT-RSS web site and check out its amazing list of features! Of course, the name is also a play on a famous advertising slogan. If you already have an appropriate web server, go for it! The requirements are fairly modest and installation isn't very tricky. Feel free to create a test account here to try out the software first. We set up this server because we were hearing from a lot of folks who were still looking for a replacement for Google Reader—folks who were "power users" but not necessarily sysadmins. If you've set up a public installation of TT-RSS (for English speakers) and you'd like to share popular feed information, get in touch! Here's the reader. If you need to create an account, click on "Create new account", give us your email address, and we'll send you a password. In addition to the OPML import option mentioned above, you can subscribe to feeds one at a time using Actions | Subscribe to feed. You can enter the exact feed URL you want to use, or you can just paste the URL of a page on the blog you want to read and let TT-RSS find the information embedded in the web page. No problem. In addition to TT-RSS' many customization options, we've installed a number of plug-ins that you can use to enhance your feed-reading experience. We've left most of them turned off to keep things clean for the minimalists among us, but you can find them under Actions | Preferences | Plugins (hiding at the bottom). Can I use ReadTiny on my phone/tablet? There is an official Android client for TT-RSS. So, yes. We've tested it, and it works. The price seems reasonable, and you can try it for free. There also appears to be a third-party TT-RSS client for the iPhone/iPad. So, maybe. We don't do Apple, so we haven't tested it. Of course, you can also use a browser. Or you can aggregate everything to a personal feed on ReadTiny and then read the articles with anything that understands RSS. David Whelan explains how to do this in Firefox and Chrome. Yes. When you subscribe to a feed, check the "The feed requires authentication" option and enter your login and password information. Please do not use the same password for an authenticated RSS feed that you use for another web site—we take good care of the information you share with us, but you should still minimize your risks by using unique passwords on every web site. Yep. That's how we roll, too. Actions | Preferences | Preferences | Uncheck "Automatically expand articles in combined mode" and Bob's your uncle. We use fewer electrons...and pass the savings on to you! Well, OK, seriously, if you want to make us a cool logo or something, we'd consider bartering for a subscription. We're kind of busy setting up this site and running a web hosting company, among other things.